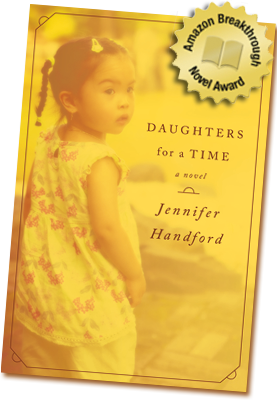 Jennifer Handford will participate in Great Writers, Right Here. 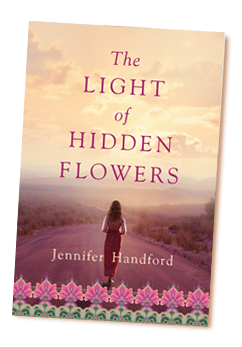 Author of three novels, most recently, The Light of Hidden Flowers, Jennifer will appear at this event, hosted by the Fauquier County Public Library, on Friday, September 30 from 6 – 8 p.m.
Great Writers, Right Here will bring together local published authors, and readers who will have the opportunity to stroll from table to table and meet the authors. 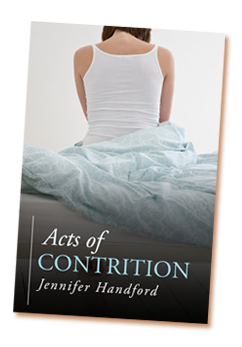 Jennifer will share and discuss her work with the community and sign and sell her books. Three Books Down, and Still Learning. When it’s my turn in line at Starbucks, I order a decaffeinated latte and without thinking I utter, “sorry.” Whether real or perceived, I feel that the barista is judging me for ordering decaf. After all, isn’t the point of coffee the caffeine? I could offer support and tell her about my weak stomach lining, how I’d feel the acid splashing for hours, but then I’d run the risk of sounding needy. Once home from the morning loop of dropping off my three kids at school and humbling myself at Starbucks, I settle in at my computer. As a writer, I have a mountain of work to do: essays to write, a website to update, a barrage of social media sites to post to. Not to mention the next book — that unruly behemoth of a document that requires the most attention. The kids are at school. The clock is ticking. Everything else could and should wait. But my brain is a hamster on a wheel, and with each revolution I am reminded of all the motherly duties I’ve left undone: Daughter No. 1 needs to get to the orthodontist; Daughter No. 2 needs the dermatologist; Daughter No. 3 needs a new tennis racquet. I scribble down a quick list of 15 items. I shove the formidable mommy to-do list from my brain, but it’s hard to say no to the nurturing, caregiving side of myself, kind of like slamming the door on Girl Scouts selling cookies. My first nature is to take care of my family. But I also want to advance my career. Damn me, wanting to have my cake and eat it, too. I focus on my writing, managing to edit a good 20 pages of the next novel and am preparing to launch into some new material. But then the laundry buzzes, and because I know Daughter No. 2’s soccer uniform is in it (one she’ll need for this afternoon), I pop up to empty the load. While I fold, I click on CNBC. Female newscasters, female analysts, female fund managers. By all accounts, females have succeeded; they have procured the same opportunities as the men. Yahoo CEO Marissa Mayer is so committed to her job, she has declined her right to maternity leave when her twins arrive. The commentators bicker back and forth, debating whether this is a smart move for her career, for her family. A conversation that would never ensue if she were a he. I deliver the laundry bundles to the doors of my children’s rooms. Then I get back to my computer. I’m inspired to write some new pages, but in the back of my mind the to-do list ticks like a metronome. More immediate than the novel deadline is a batch of other commitments: A book review, a magazine essay, a list of my favorite reads for a literary blog. I’ll get to it all, I vow. But first let me write these new pages. I’m two pages in when an alert pops up at the bottom of my screen: Grandma’s birthday. I quickly click on my online calendar. I see that we’re entering into the birthday season for my family. In the next four months alone there are six birthdays to celebrate, in addition to Thanksgiving and Christmas. There is too much to do and not enough time. I’ll get it done, but how well? A dark cloud of inadequacy hovers over me as the shame seeps in. The constant worry of not measuring up either at home or at work nags at me like a fly buzzing at my ear. As Sheryl Sandberg writes in Lean In, “The stereotype of a working woman is rarely attractive. She’s almost always harried and guilt-ridden.” I envision a cartoon depiction of me, a frantic woman running in circles like a dog chasing its tail. I think of the novel I Don’t Know How She Does It by Allison Pearson. The female protagonist, Kate, having just flown in from a business trip in the middle of the night, switches roles from high-powered hedge fund manager to at-home mother and attempts to “distress” a store-bought mince pie for her daughter’s school in an effort to make it look homemade. Having done this, she then needs to dispose of the evidence — the store-bought wrapper — lest her nanny rats her out to the other moms. The pressure of being the perfect mom while at the same time the ladder-climbing working woman bears down on her like the Boeing jet she just flew in on. Later, I drive up to my kids’ school for a parent association meeting. I’ve “over-volunteered,” as I frequently do, chairing multiple committees. With two daughters entering high school next year, I know my time with them is dwindling. I want to be as involved as I can. While another woman speaks, I feel the buzz of my phone. I take a peek. A text from my mother. “Still alive?” it reads. “Haven’t heard from you for a while.” I add Call Mom to my mental to-do list. The obligations abound: to my husband, children, and parents. To the workplace, my volunteer activities, and maintaining the home. Sandberg has described my frustration perfectly, the “holy trinity of fear: the fear of being a bad mother/wife/daughter.” I don’t want to disappoint anyone. For women, balancing our home life with our work life is only the first step. We also need to strike the just right tone. I want to be heard, but I also want to be liked. Society — for all that it has allowed in terms of feminism — still demands that we act appropriately female. No one likes the loud-mouthed woman. Ambitious and aggressive women violate our social norms about how we should act. We expect men to be driven and decisive. We expect women to be sensitive and communal, says Sandberg. And it doesn’t take much to be labeled in a derogatory way. Just standing one’s ground is often enough. In her book Quiet: The Power of Introverts in a World that Can’t Stop Talking, Susan Cain claims that our society values extroverts, the booming man of action, who talks first and loud, who takes risk, and whose charisma is spell-binding. Our culture used to value the person of introspection, the quiet, prudent, and morally upstanding individual, Cain says, yet now we love the salesman, the Tony Robbins of the business world. This could account for Trump’s popularity. Side by side, he out-“charismas” his opponents. If this is true, and if we as a culture reward the booming, engaging individual, women are in a real fix. In our guts we know our place. We know it’s okay for us to want to strive and thrive in the worlds of business, academia, medicine, and any other field. But we also know that our female role requires us to be nice, compassionate, and caring. We can only be so forceful before we cross the line and offend those same people we’re trying to impress. Maybe that’s why we apologize our way through the day, even at Starbucks. In a recent satire by edgy comedian Amy Schumer, a group of professional women innovators have been asked to participate in a panel discussion. What follows is a string of apologies for saying too much, too little, for clearing one’s throat, for asking a question, and for being misconstrued as the wrong type of scientist. At one point, one of the panel members (played by Schumer) offers to “run to the store” to get medicine for an ailing audience member — the ultimate show of female nurturing, even when she’s working. Perhaps the apology is our way of permitting ourselves to lean in. It’s the compromise that says we will no longer be silent, relegated to a lesser position, but will preface our opinions with a copious amount of “sorrys” and all the other precursors that beg our listeners to hear us but also to still like us. Maybe we are just truly sorry. Sorry for being both a mother and having a job. Sorry that we can’t be in two places at once. Feeling sorry just might come with the territory of assuming so many different roles and creating the fraud that’s inherent in being one thing to one person and another thing to another. When I’m around a group of moms, I want to be just like them, telling silly stories about what our children said, debating best techniques for homework management, and swapping lunch box ideas. When I’m conducting business, I play a different role with different tones, different vocabulary, and different body language, which hints at living two lives. Yet women are anything but fraudulent. The honesty with which they scrutinize their own abilities is often to their detriment. In researching for their book, The Confidence Code, Kay and Shipman found that women will only apply for jobs or promotions if they feel they’re 100 percent qualified versus men who will take the chance, even if they’re woefully underqualified, gauging their abilities at maybe 50 percent of what’s needed. More likely the reason we apologize so much is simply that our confidence doesn’t match our competence. For all the strides made — females earning more college and graduate degrees than males, closing the gap on middle management, and inching our way toward a more equitable pay — we’re still not finding the bold confidence to own our accomplishments. Discounting our abilities is a female phenomenon. Women are likely to attribute their successes to the help from others, luck, or being in the right place at the right time. Men more easily attribute success internally, stating that a victory was due to his high level of competency. It seems that we as women, in general, are quite hard on ourselves. We worry about whether we’re allocating our time properly, we ruminate to the point of constant worry, and we demand perfection. Perhaps the next rung of feminism we must reach for is owning our accomplishments, without apology. But for now, it’s a crisis of confidence and for that, I’m truly sorry. Before I had my “pitch” ready, people would ask: “What’s your new book about?” In reply, I would juggle a bunch of words in the air: father, daughter, Afghanistan, India, introversion, bravery. Whoever had innocently asked the question would then look at me like maybe I didn’t know the answer myself. In fact, I hadn’t randomly drawn a bunch of words from a hat. The seeds for THE LIGHT OF HIDDEN FLOWERS were planted much more naturally. Years ago, I happened to be in the audience and listening to a speaker at a business conference. The guy was one of those larger-than-life, charismatic types—a born storyteller. I had heard him a few times before over the years, and I always straightened in my seat when he strutted onstage. How does he remember so many stories? I’d think, because he never consulted a note. He was a Johnny-on-the-spot, always ready with the perfect anecdote and the Kaboom! punchline to drive home his point. A few years later, I happened upon Susan Cain’s seminal work, QUIET: THE POWER OF INTROVERTS IN A WORLD THAT CAN’T STOP TALKING (2012), which struck me as being in the almost exact opposite mode of the Kaboom! guy’s. Cain dispels the notion that quiet, or introverted, individuals fall short as contributors to our society. To the contrary, she asserts that people who listen and think before taking action are often more successful than their impulsive and louder counterparts. Her research was especially insightful as she studied the financial industry and the last recession, where much of the trouble was arguably exacerbated by the gregarious rainmakers on Wall Street who prevailed over many “quieter” whistle-blowers. Along the way, a few nuggets from that dynamic speaker along with the concept of introversion, merged, and I got an idea for a novel. My protagonist would be introverted—brilliant but quiet. She would work with her father, the charismatic superman in her life. But the father would leave her. He would get sick and die, and she would have to stand on her own two feet. From there, the flowers grew. The story of lost love, the travel to India, the responsibility of adulthood for my once diffident protagonist. At some point I realized my character was on a modern-day hero’s journey. My kids had taught me about Joseph Campbell and the monomyth, so that made writing this novel especially meaningful. There’s a little bit of them woven into the words. I crafted Missy first. She’s book smart, wry, quiet. A girl who aced every test she’d ever taken but hadn’t followed her dreams for fear of leaving her father behind. Missy’s closest relation is her father, Frank, whom she loves dearly. For his backstory, I made Frank an army guy. He often ruminates about the Vietnam War. His personality is optimistic, expectant, hopeful. He has fond recollections of his buddies from the war, but I had to be sure not to mischaracterize his affection for his friends as a warm regard for the war itself. To gain the proper perspective, I turned to Tim O’Brien’s unrivaled THE THINGS THEY CARRIED (1990). O’Brien didn’t believe in the Vietnam War; to the contrary, he believed it to be unjust. So he takes a few days in a cabin in the woods in Northern Minnesota and considers whether to dodge the draft. But he gives in to pressure—societal pressure, small-town pressure—and in the end, goes to war . . . because he is embarrassed not to. I decided to make Missy’s beloved, Joe, an amputee war veteran who had served three tours in Iraq and Afghanistan. To gain perspective, I turned to Adele Levine’s groundbreaking work, RUN, DON’T WALK: THE CURIOUS AND CHAOTIC LIFE OF A PHYSICAL THERAPIST (2015). Levine is a physical therapist who worked with amputees from the wars in Afghanistan and Iraq for six years in the glassed-in gymnasium at Walter Reed Army Medical Center. She relies on heartbreaking grace and humor to tell her story and the stories of the vets she worked with. She writes that she initially took the job at Walter Reed out of convenience, but years into it—when waking with night terrors, dreaming of a floating head with no limbs—she knew that the job had consumed her from the inside out. I also turned to Phil Klay’s REDEPLOYMENT (2015) in hopes of gaining perspective on the painful adjustments a vet must make upon coming home. Where’s a guy supposed to rest his hands now that he’s not holding a gun, having done so for many months? After seven months in a war zone, how odd is it to stand in the dressing room at an American Eagle Outfitters in a mall, trying on clothes your wife is handing you? What’s it like to walk down a street in Anytown, USA, without scanning the rooftops, without having your antennae up for anyone or anything that might kill you? How do you just get back to normal—to an alertness of “white”—safe—when you’re always at “orange”? Lastly, I consulted a real-life marine, Colonel Matt Day of the U.S. Marine Corps. Matt is a friend of our family, and while I’m typically a bit shy about asking for help (a little like Missy! ), I asked Matt to review the sections that pertained to being a marine and to the USMC in general. He corrected some of my word choices, phrases, and descriptions, but more than anything else he contributed, Matt’s commentary made the experience of war real. His firsthand accounts of IEDs, night terrors, and the lifelong haul (physically and emotionally) that our service people carry hit me straight in the heart. Knowing that this is for real—that our men and women are out there, fighting this fight every day—my gratitude for their sacrifice is great. Having realized I was writing a modern-day hero’s journey, I knew my protagonist had to actually take a journey. And given Missy’s fear of flying (both literally and figuratively), hers would have to be a faraway adventure, so I dove in and began my research on India. I watched videos—tourist videos, political videos, charitable videos. I read from the pages of UNICEF publications, and those of other philanthropic organizations. Eager to immerse myself in the details of everyday life in India, I turned to THE LEAVING OF THINGS (2014) by Jay Antani, an informative novel about a teen-aged boy who returns with his family to India from their home in Wisconsin. As for Missy’s profession and her desire to travel and contribute to some larger good as a philanthropist, those details were drawn partly from my own life. I spent many years as a financial adviser. And in college I studied political science, and I was very absorbed in “country watching” and had a strong desire to travel. I wasn’t quite Peace Corps material but was interested in the world nonetheless. As with every story I’ve written, THE LIGHT OF HIDDEN FLOWERS started with just a concept: a girl and her father. The concept crystallized and grew. Characters developed, the various levels of plot deepened, connections were woven. And lastly, always lastly, evidence of theme bubbled to the surface. How we define ourselves, how others see us, how our memory aids us and fails us. How our greatest assets are often disguised as shortcomings. How each day is a search for hidden flowers. A high school student once asked me the same thing. I said something along the lines of my having (and appreciating) the satisfaction of seeing and holding the final product. And truly, there is great reward in planting a seed, caring for it and watching it grow. But the question nagged at me, because I thought there was more to it than the literal sense. I believe the real answer is that writing is like being an archaeologist of the human heart. It’s as if I’m dusting off the bones of our human condition: my task is to find the words to express pain and grief, shame and guilt, and joy, love, and euphoria—and then to veer all the way back again to heartache and sorrow. It’s an opportunity to wrestle with all the hard questions in life. As human beings, we all have the same basic need: to be loved and accepted. I’m forever in awe of the book EAST OF EDEN because John Steinbeck so painfully describes how “The greatest terror a child can have is that he is not loved, and rejection is the hell he fears.” He goes on to say how rejection leads to anger, and with anger there comes some sort of crime . . . and then, the guilt. According to Steinbeck, the “chart of the soul” has many paths, depending on the human spirit. I think that’s the essence of just about everything: the mystery of the heart and the soul, and the ordinary life one must live each day while making the extraordinary decisions that make his or her own path wholly unique on this earth. Life is hard, love is hard. Writing about life and love is hard. But living life and knowing love is our reward—and writing about it is my joy.